Read session reports in the June 2016 issue of AIIP Connections (PDF). Learn more about the speakers. AIIP members can log in to access session handouts. Nicole Fende, The Numbers Whisperer - "Strength in Numbers: Make the Most of Your Essential Success Partner"
Leona Mitchell, University of Pittsburgh - "Five Common Mistakes Every Consultant Makes"
Jeff Evans, Designed Learning - "Flawless Consulting - An Interactive Session"
Marge King and Joann Wleklinski - "Collaboration: How AIIP Networking and Two Glasses of Wine Turned into a New$letter"
Mark Goldstein and Marydee Ojala - "60 Sites in 60 Minutes: Partnering with the Internet"
Jocelyn Sheppard (coordinator) - "Partnerships: Real-Life Stories from AIIP Members"
Lynn Strand - "Five Ps to Success: Planning, Partnering, Personality, Parties, and Perseverance"
Jane Langeman, AIIP President-Elect - "Be the Change You Want to See at AIIP"
Jennifer Burke - "Get Your Head Out of the Clouds, Put Your Business in the Cloud Instead"
Beth Plutchak - "Manage Your Time When You Cannot Work a Typical 9-to-5 Day"
Judith Binder - "Primary Research Interviewing Tips and Techniques"
Matt Von Hendy - "A Solopreneur Offering Webinars for Pay and Play: Lessons Learned"
Tom Wolff - "Security, Encryption, Passwords, Backup, Devices and the Cloud"
Susanne Bjorner - "Redefining Retirement"
AIIP past president and founding member Susanne Bjorner spoke about AIIP’s history and accomplishments over 30 years of connections and conference-going. 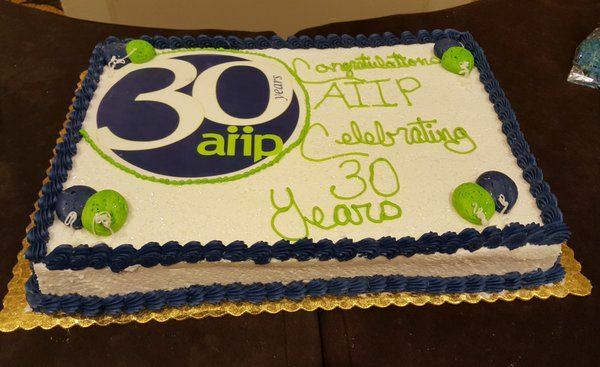 AIIP recognized the recipients of several annual Awards during the conference. Marilyn M. Levine AIIP President's Award - John Bryans, Publishing Editor, Information Today, Inc.
Sue Rugge Memorial Award for mentoring - Jan Sykes, Information Management Services, Inc.
Myra T. Grenier Award for a first-time attendee - Liz Lamoreaux, Lamoreaux Research, Inc.
AIIP Connections Writer's Award - Cathy Chiba, Dauratus Research, Inc., for her article, "Overcoming Stage Fright: Lessons from Centre Stage," AIIP Connections 29(4), December 2015. Read it here (PDF). Archer Van Den Broeck Ltd.
"I loved the additional planned opportunities for networking including the Birds of a Feather lunch that gave more opportunities to mix it up." "The networking with others is the best! Thanks for always making a good amount of time for this." "I love this tradition [of introductions]! I am a first-timer and had several people tell me they sought me out because of what they heard me say in my introduction." "The [30th anniversary] slideshows and speeches were great. Gave me a sense of the history of the community." "The overall discussions and presentations connected for me and led to some significant "aha" moments." "I felt like I'd come home." Pittsburgh’s Center of Life Jazz program, a source for free music education and performance opportunities for youth across the Pittsburgh region, was the beneficiary of AIIP’s 2016 local give-back drive. Together AIIP members raised $2,025 for COL Jazz and enjoyed a live performance. AIIP extends its thanks to Roger Summit for his generous matching donation. AIIP's 31st Annual Conference will be held May 18-21, 2017, at the Hampton Inn Convention Center on the waterfront in New Orleans, Louisiana, USA.